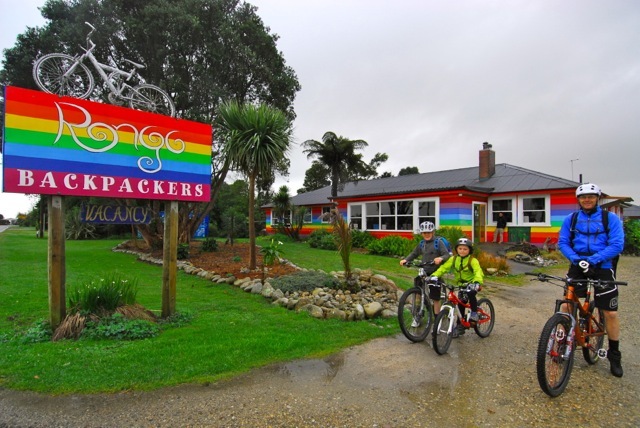 Zac Stones and James Hartshorne arrived at Rongo Backpackers & Gallery (www.rongobackpackers.com) on July 17, 2013 after a four-day adventure mountain biking on the Heaphy Track with their Dads Damian and Brent. 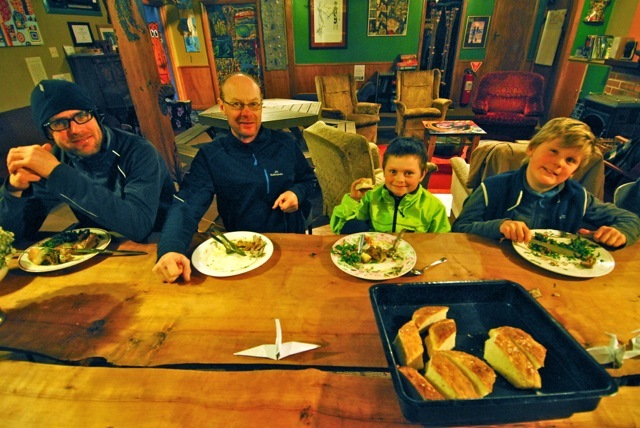 The Father and Son Team enjoy a Heaphy Conqueror’s Feast at Rongo Backpackers & Gallery in Karamea after finishing the Heaphy MTB ride. 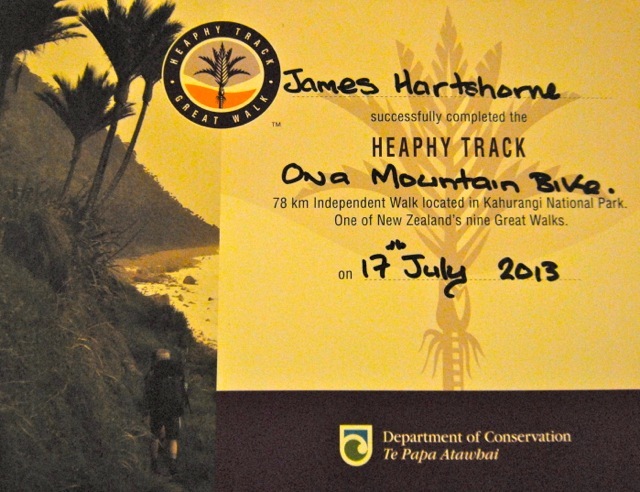 At nine years old, James is possibly the youngest MTB rider to have completed the Heaphy Track. “It was really cool and I’d definitely do it again,” said James. Zac also had a great time and said, “I’d recommend it to other kids, I can’t wait to do it again and come back to Rongo,” he said. Zac enjoyed best the coastal section of the track from Heaphy Hut to the Kohaihai, while James really liked the downhill section from Mackay Hut to Lewis Hut and the Saxon to Mackay section because it was all frozen and there were icicles along the sides of the track. Damian and Brent have ridden the track many times, but this was the first time they’d done it with their boys. Zac didn’t fall off once, James had a couple of minor spills along the way, but it was Damian who had the best stack. “I was coming along behind James and watching where he was going and didn’t see the large rock in the middle of the track, which I hit and basically pedalled myself over the handlebars,” he said. Experienced rider Brent has done the Heaphy about 25 times by himself and usually rides all the way through in one day. However, riding with the boys was a different experience as they spent four days and three nights on the track and could take it easy and enjoy the scenery and really enjoyed the quality time spent with his son. “It was more like a journey than a ride,” he said. The father-son team were met at the Kohaihai Shelter by the Karamea Connections (www.karameaconnections.co.nz) shuttle and taken to a hot shower at Rongo. After a hot shower, the boys had an origami lesson with Japanese wwoofer Kengo Shimuzu and learned how to make paper cranes, they then became radio DJs and played some records on Karamea Radio, which broadcasts from the radio station in the garage behind Rongo. The team was then treated to a famous Rongo Heaphy Conqueror’s Feast to celebrate finishing the track. On the menu was homemade focaccia bread with pumpkin soup, roast organic venison and lamb, roast potatoes, kale and carrot salad and kiwifruit sorbet for dessert…all locally grown, organically grown, freshly harvested food grown on the LivinginPeace Project (www.livinginpeace.com) Permaculture Farm, which is associated with Rongo Backpackers & Gallery. 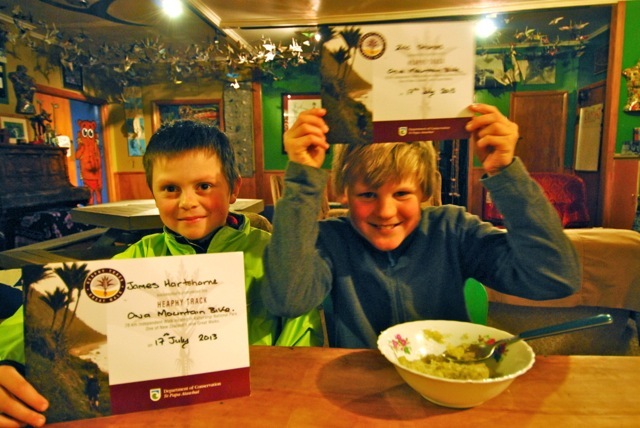 James Hartshorne (left) and Zac Stones proudly display their Heaphy Track MTB completion certificates. After dinner, the team sat around a bonfire and listened to the DJ Crap and the Big Man Blues Show, which is world famous (in Karamea) as the longest-running radio show on Karamea Radio. The Blues Show is a Wednesday night staple in Karamea and has been broadcast every Wednesday for nine years…tune in any Wednesday night in Karamea to 107.5 FM for blues, news, witty banter and irreverent hilarity. After a good nights sleep, the crew were up early to farewell Damian who took the Karamea Connections shuttle back to the Kohaihai and rode back to Browns Hut. Brent and the boys took an easier route home. They flew with Adventure Flights Golden Bay: http://www.adventureflightsgoldenbay.co.nz from Karamea Airport back over the Kahurangi National Park along Heaphy Track to their car at Browns Hut. 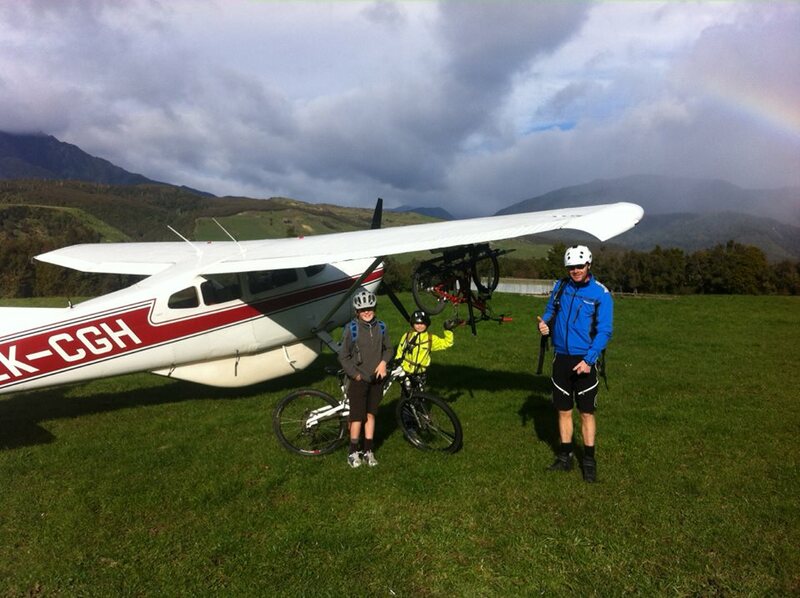 The rest of their school holidays is unlikely to be as fun as their Heaphy Father and Son adventure. 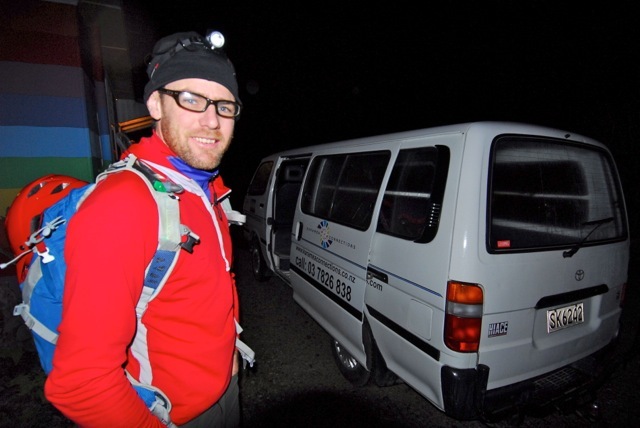 Well done James, Zac, Damian and Brent…thanks a lot for staying with us at Rongo and come on back again any time. This entry was posted in Business, Children, Department of Conservation, DOC, Education, Environment, Heaphy Track, Historical, Kahurangi National Park, Karamea, Karamea Radio, LivinginPeace Project, Media, Mountain Biking, MTB, New Zealand, Permaculture, Photography, Radio, Social Commentary, Sport, Sustainablity, Travel, West Coast and tagged Brent Hartshorne, Damian Stones, Department of Conservation, DOC, Heaphy Conqueror's Feast, Heaphy Track, James Hartshorne, Kahurangi National Park, Karamea Connections, Mountain Biking, MTB, Remote Adventures, Rongo Backpackers & Gallery, School Holidays, Youngest Heaphy Track MTBer, Zac Stones. Bookmark the permalink. Hi, we are no longer Remote Adventures, We are Adventure Flights Golden Bay, Great stuff all the same! Roger that Captain Mit…I’ll change the copy. I look forward to working with you. What happened to old Jim? Roger that Captain Mit…I’ll change that…thanks for reading The Rongolian Star!